I think I know Los Campesinos! because I am familiar with their name. But I believe that is because their name has been on the billing at all the festivals I never make it to. Which ones? I don't know. To quote the effervescent Sarah Palin, "Oh, all of 'em!" But I think a festival with this seven-piece band on its roster is definitely on my Must Have Soon list. Even if it's in Alaska or practically in Russia. 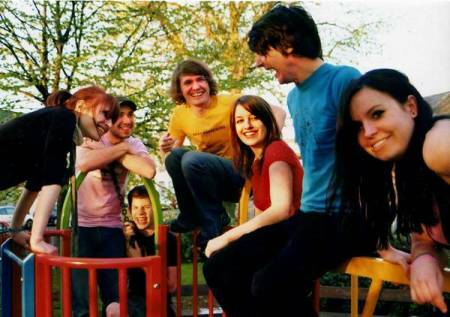 Los Campesinos! is comprised of seven young indie-poppers, the original few meeting in college across the pond and the rest of the members joining as interests and performances collided. And that's what the music sounds like. But in a good way. It's a jovial marriage of happy melody, marginally annoyed and disaffected lyrics, and garage rock distortion. You've got glockenspiel, violin, keyboards, horns, and everything else required to ignite mania. Together for the last few years, the band's current record, Romance is Boring, has been out for over a year. Get to know them well and impress your friends when you pick up their new album when it drops next month: November 15. It will be called Hello Sadness. So don't say I never told you. Pick up their prior works, get this new one, and understand why all the emo kids have "We Are Beautiful, We Are Doomed" tattooed on their chests.